Sultan Sir Badlishah ibni Al-marhum Sultan Sir Abdul Hamid Halim Shah (1894–1958), postmarked in Alor Star, where the author's father was born and raised in a kampong (village) during the Japanese occupation. Kedah was the nucleus of southeast asia's oldest civilisation, a hindu-buddhist kingdom as long ago as 110 AD. The sultanate was thought to have begun in 1136 AD, which would make it the oldest in the Malay peninsula. 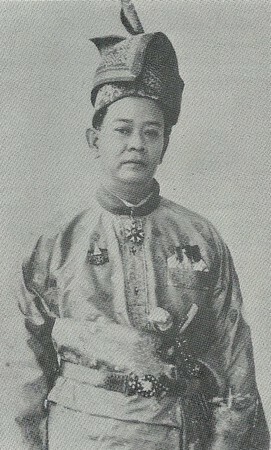 In more recent centuries Kedah became a confluence of Thai and Malay culture (Falarti 2013). It is the home state of Dr Mahathir Mohamad. 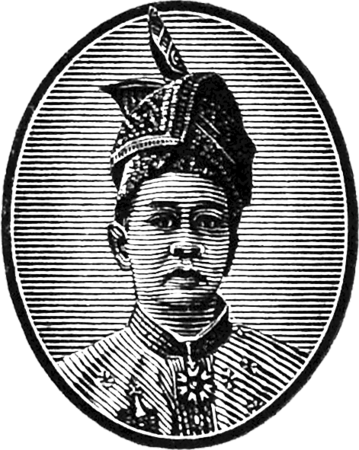 The shoot of the sultan’s tengkolok penetrates the medallion rim (left), giving the portrait a subtle three-dimensional 'pop'. Notice the radial gradation of the thickness of the background lines in the sultans' medallions, different from the bilateral gradation in medallions of the British monarchs, a perceptive bit of design to suit the forward-facing portraits of the former. Right: the photograph, of unknown creator, from which the engraving was derived. The sultan is wearing the neck badge of the Knight Commander of the Order of Saint Michael and Saint George awarded in 1948, with its seven-armed Maltese asterisk. The use of a serif typeface is unusual in the coconut definitive and enriches its typographical palette. This typeface resembles those designed for newsprint and advertising at the time, combining authority with simplicity and legibility. The slab serifs were good for printing with wood type in the old days because the serifs were easy to cut in wood, and indeed give the typeface a woody character. Rice is the southeast Asian staple, and Kedah with its flat coastal plains (Holley 1995) was the most important rice-producing state in Malaya (Falarti 2013), sacrificing economic development and retaining much of the rustic charm of rural Malaya. 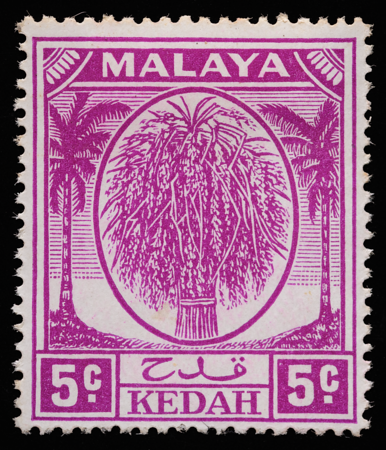 The low denominations of the Kedah coconut definitives showcase a sheaf of seeded rice stems (padi), which has on occasion been mislabelled as a tree. Being the only design incorporating both coconut and rice, it is christened the nasi lemak issue by the author, after the traditional Malay breakfast dish of rice infused with coconut milk, served with sambal, fried anchovies, roasted peanuts, egg and slices of fresh cucumber. So important was rice and so iconic was the sheaf-of-rice design that it earned a place alongside monarchs and coats of arms in the coconut definitive. In 2017, nasi lemak itself became the theme of a dress worn by Malaysian representative Samantha Katie James at the Miss Universe pageant. 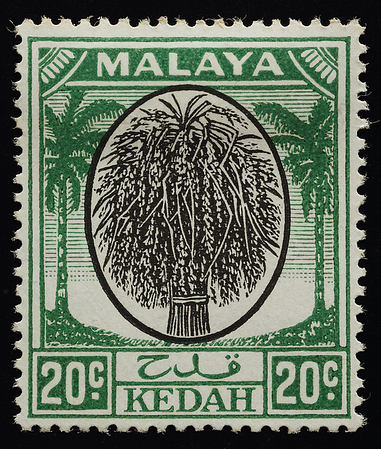 The sheaf of rice was originally engraved by De La Rue for the first-ever definitive stamp design of Kedah, based on photographs supplied by the British Advisor to the Kedah government in 1911 to the Crown Agents (Holley 1995). 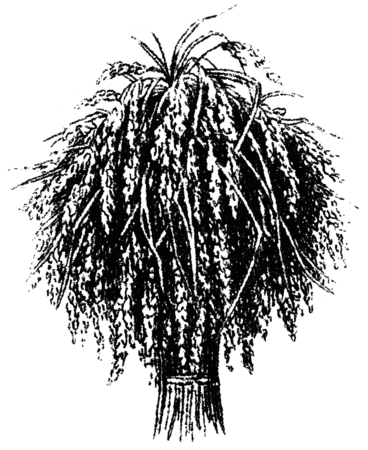 He requested that the artist improve on the nine photographs, as one was out of focus, another had leaves sticking out at the top making it look too “wild”, and the rest looked too “lumpy”. He even included six photographs of single ears of padi to help the artist. Here it appears in the finely extruded golden tones of the glorious three-dimensional recess-printed 5c of 1922. The sheaf of rice is a delightful case study of letterpress (right) versus recess (left) printing. Letterpress engraving is actually much more difficult than recess engraving (Lush & Skinner 2018), because the pattern being engraved for letterpress is the inverse of the printed pattern. It even required "special training" (Noble 1878). The engraving for the world's first letterpressed stamps, circa 1854, was made by the legendary Ferdinand Joubert himself (Lush & Skinner 2018). Because in letterpress (right) the inked parts protrude from the plate instead of being recessed into it (left), they need to be thicker to resist wear and damage. 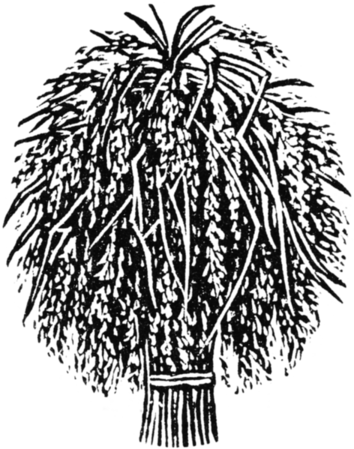 The author, however, reckons that the sheaf of rice on the coconut definitive could have been engraved smaller to allow the stalks to splay out more naturally, while horizontal hatching of an appropriate stroke and density could have been used to fill the background as in the sultan portraits. 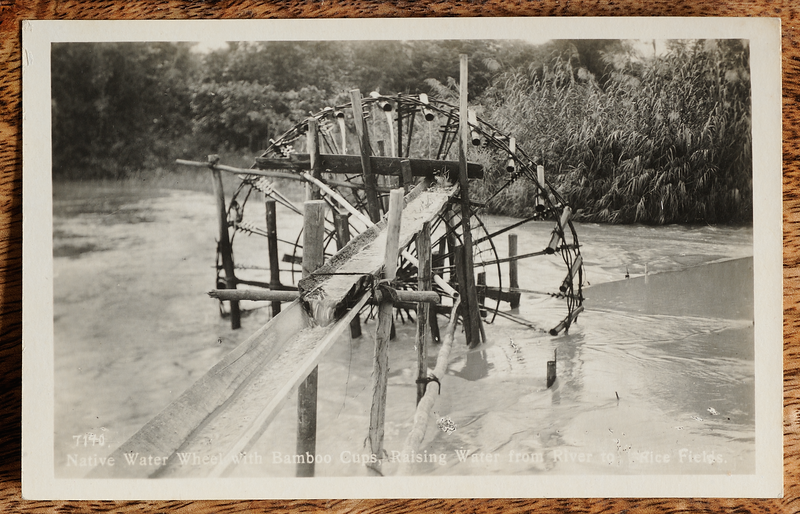 Traditional water wheel with bamboo tubes for collecting and delivering water to padi fields. The river flows from right to left in the photograph, as indicated by the triangular eddies, and the wheel rotates clockwise (along with the current). These contraptions required frequent maintenance (Hill 1977). Postcard published by Houghton Butcher (Eastern) Ltd., Singapore, on behalf of the Malayan government for the British Empire Exhibition in London in 1924. 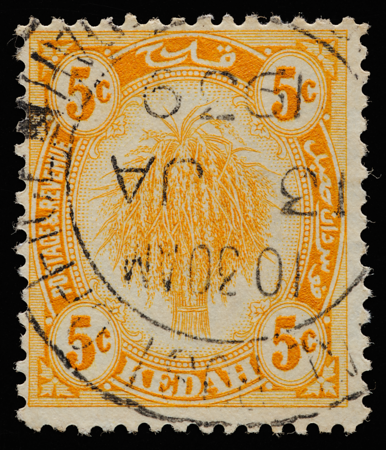 Kedah is the only state whose coconut definitives featured different vignette designs for the low and high values. 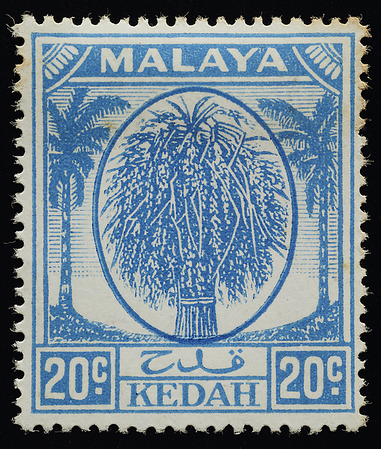 Furthermore, the Kedah 20 cents enjoys the unique distinction of having a standalone head plate made exclusively for it, since all other Kedah values featuring the sheaf of rice are single-working-plate prints. The idiosyncrasy of the Kedah series in turn highlights what seems to be a little-known quirk of the coconut definitive. Apparently, whether the 20 cents or 25 cents should be considered the start of the bicoloured high values was a point of contention (Lin 2017d), as evidenced by the 20 cents' initial colour scheme of black and green. 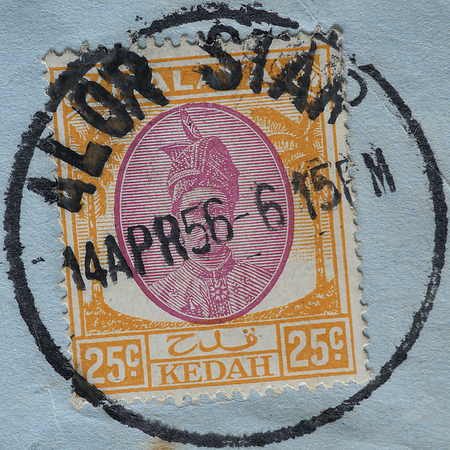 Its subsequent change to blue was due to UPU colour requirements for standard postage rates, but this does not address the curious inconsistency where the sheaf of rice was used on the Kedah 20 cents bicolour instead of the sultan's portrait which appeared on all other bicoloured values. A converse inconsistency almost arose when De La Rue submitted a die proof of the new monochrome 20 cents (Crown Agents, Philatelic and Security Printing Archive) featuring the sultan's portrait. It was, however, annotated as not approved by the Crown Agents. It seems that the 25 cents regained its pre-war status as the start of the coconut high values after all.